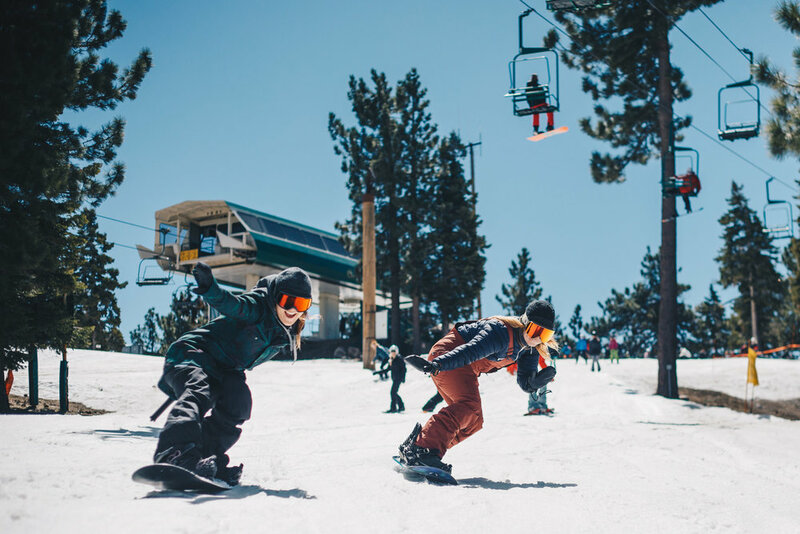 If anyone thinks it’s impossible to snowboard and surf on the same day, Ladies Shred Society will prove them wrong, rounding up 50 women to do exactly that. Ladies Shred Society hosted their 2nd-annual-weekend event and we were there to get in on the fun. Joined by pro snowboarders like Elena Hight and Leanne Pelosi and surfers like Kiana Fores and Sormarie Nieves, ladies from all different regions met to enjoy some time on the slopes and catch a few waves. Beginning Friday evening we gathered at the campsite in San Mateo to pitch tents and eat dinner before waking up early Saturday morning to head to Snow Summit in Big Bear for an afternoon of snowboarding. After the adventures in Big Bear it was back to the campsite and then straight to the ocean with no time to waste, finding ourselves quickly zipping up our wetsuits to enjoy some small but fun waves at San O just before sunset. We snowboarded. We surfed. We ate delicious healthy meals freshly prepared just for us. We sat around the campfire. But most importantly we caught up with old friends and mingled with new ones. Between the sweet conversations, laughs on the van ride to and from the mountain and all of the yummy treats provided, the weekend was one for the books.